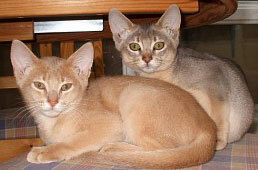 As far back as four thousand years ago, Abyssinian cats were a very original breed of cat in ancient Egypt. 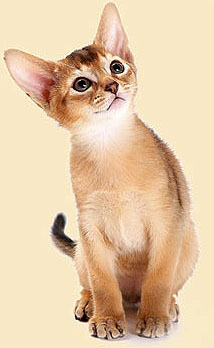 Zula was the first Abyssinian cat that was brought to Europe by a British soldier. This was quite after Britain’s victory over Abyssinia in 1868 during the Abyssinian war. Although the Aby was brought to the United States in the 1900s, it only became popular around the 1930s. 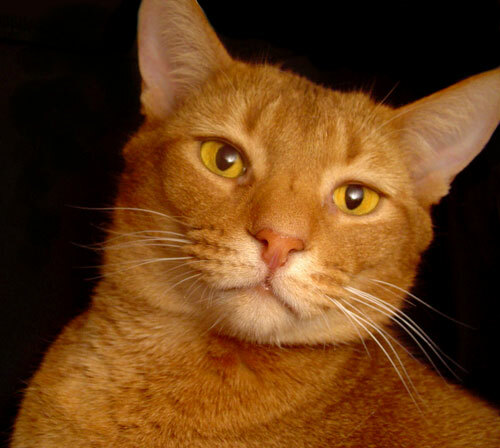 All around the world today, cat breed registries, such as The International Cat Association and The Cat Fanciers Association, recognize the Abyssinian cat. It is among the top five most popular cat breeds of the world. 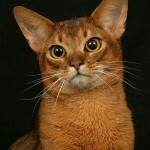 The main characteristic that makes the Abyssinian different is due to a single gene that is present in the Abyssinian cat, which gives their coat a translucent effect. Their fur is a very fine texture rather than being of a soft quality which bears several dark bands over a lighter shade marking the coat evenly giving it a ticked coat pattern. They are muscular cats with very long bodies and can weigh from around nine to about seventeen pounds. 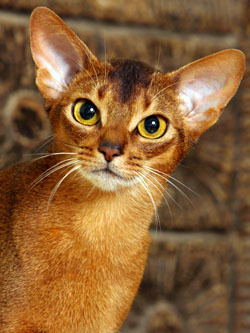 The Abyssinian’s eyes are large and they sport dark rims round their eyes over a background of a light shade of hair. The Aby’s large ears are cupped with tufts of fur at the tips. The Aby possesses slender legs with small paws. They also have long tails that can measure up to its entire length. 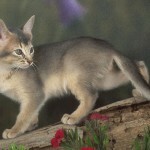 Abyssinians Are Curious And Athletic Cats! 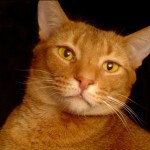 Abyssinian cats are extremely motivated and curious. It is a good idea to child proof your cupboards and cabinets if you want to keep your inquisitive Abyssinian cats out of your belongings. They require a lot of attention, and prefer to be shown off by being perched high on your shoulder than curled up in your lap. This breed of cat is extremely athletic and is capable of soaring to heights of six feet in the air and can sprint at an exceedingly fast pace. Unlike most cats, they enjoy climbing up onto things, so you’ll need to keep any breakable items out of harms way. Abyssinian cats require lots of attention and care, as when they become bored you can find them climbing things and snooping around the house. Always keep them occupied if you wish to avoid such instances. These cats can be extremely loving and gentle. They love to perch on the owner’s shoulder rather than lay still curled up on your lap. They are very talkative and vociferous. They do not take well to being caged, and prefer being left to roam and explore. They can live to about ten or twelve years of age. 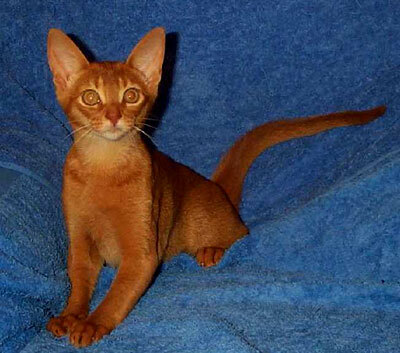 Abyssinians are a special type of tabby cat by their beautiful ticked coat that makes them so unique. 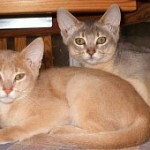 There are four colors of abyssinian breed wich recognized for championship by CFA: Ruddy, Red (Sorrel), Blue and Fawn. 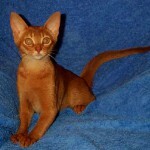 Ruddy – this color of Abyssinian cat is most popular. Orange-brown, each hair ticked with two or three bands of either black or dark brown with a vibrant burnt orange color closest to the skin. Coat is warm brown ticked with black. Base color is deep orange. Tail tipped to black, paw pads are black, eyes are pure amber, green or gold, nose leather is brick red, outlined with black. Red (Sorrel or Cinnamon) – warm copper red ticked with chocolate red-brown. Base color is deep apricot. Tail tipped with chocolate brown, nose leather and paw pads are rosy pink, eyes are pure amber, green or gold. Blue – A warm soft blue-gray ticked with deeper blue. Base color is pale cream. Tail tipped with a deep shade of blue, paw pads are blue-grey, nose leather is dark pink, eyes are pure amber, green or gold. Fawn – soft pinkish-cream color of coat, nose leather and paw pads are pink, eyes are pure amber, green or gold.